On-Chip sorter could be applied for the cell therapy and cell based diagnosis. 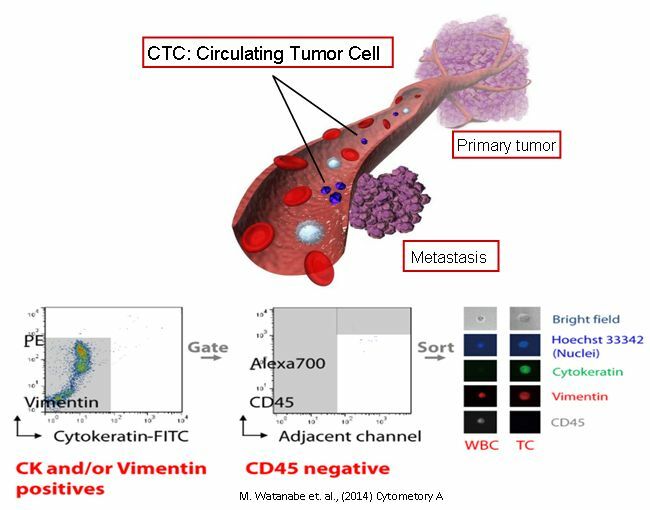 For example, it is already possible to detect and separate the Circulating Tumor Cell, CTC in a ultra-low volume blood of the patients suffered from various cancers with On-Chip Sort. After sorting, the cells can be used for cell culture to monitor and select the optimal drug and analyze the gene variations. On-chip Sort can be installed on a bio-safety cabinet because of its small foot print, process sorting without damages on the cells, and provide wide selection of sheath liquid and contamination free sorting. All these features work well for this applications. Currently On-Chip Biotechnologies products do not have any FDA compliances.